From time to time my mother appears bringing a gastronomical rarity. Sometimes it's a sauce from a far away country, other a recipe mentioning ingredients only available in history books or, as a few days ago happened, with a really strange vegetable in her shopping bag. The object of study is called romanesco and looks like a cactus with pine pedigree that has had enough aesthetic sensibility as to grow following the rules of a fractal. And it's green. Ok, that's not bad in itself, specially for a vegetable, but when someone comes to you with a just discovered ingredient one of the things that makes you suspect more about its genetic origin is its color. I must recognize that thanks to this habit of hers I've grown up with a demanding and adventurous palate. Back to the cactus-pine, thanks to Internet I discovered that it's a type of cauliflower hybridized with broccoli, born in Italy (sixteenth century) and with excellent properties: it's a great source of fiber, vitamin C, provitamin A, folic acid, potassium, phosphorus, and it smells and is digested far better than other brassicas. Once the object of study was identified as edible it was just a matter of getting the apron. The resulting recipe is really delicious and definitely far more attractive to the eye and nose than classic white cauliflower! Wash and peel the potatoes and put them in the bottom of a pressure cooker with two glasses of water. Wash the romanescu, chopping off the leaves and the core and put it over the potatoes. Cook them following the pressure cooker's instructions for cauliflowers (be careful not to cook them too much or you will get a purée!). When it's ready take them out to drain. Preheat the oven at 220 ºC. Cut the potatoes in slices and put them in the bottom of a really deep tray or mould (I've used one of 22x32 cm and 8 cm tall). Cut the romanescu into small pieces and distribute them over the potatoes. Now pour the tomato slowly all along the border of the mould. Remember not to pour too much or the tomato will mask all the flavor. Pour the bechamel all over the romanescu. Bake for 10 minutes, then scatter the cheese over it and grill for 5 minutes or until golden. Serve hot. You can fry slightly the potatoes with 3 spoons of olive oil to toast them a bit before putting them in the mould, or fry them directly without the pressure cooker. You can also all a layer of sauté onions between the romanescu and the potatoes or also, your favorite herbs or a bit of nutmeg. I recommend slices of toasted bred for serving. 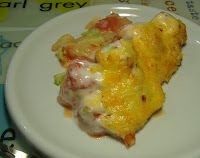 All types of cheese and many vegetables suit this recipe, so its perfect to get rid of leftovers or small quantities of ingredients: carrots, leeks, zucchini, parmesan, etc. Romanesco cauliflower is very rare - in the UK, we hardly ever see it, so I tend to pounce on them when they're available. Where a normal cauliflower can be a little bland and tasteless, the Romanesco variety are full of flavour. 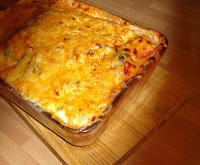 They're great in a traditional cauliflower cheese, or a gratin like yours. My kids love them, mainly because they look alien and very weird! 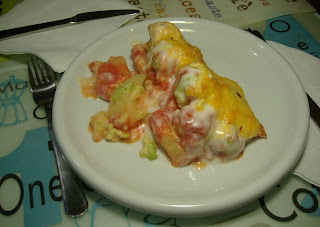 I also like experimenting with food, so it was great of discovering I am not alone in this. 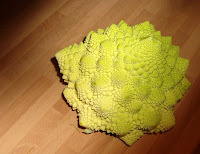 The Romanesco looks very interesting.